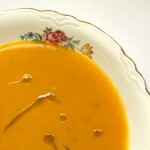 Butternut Squash is roasted and added to browned butter to make a creamy and delicious soup. This dish is perfect for fall! Pre-heat oven to 350F. Halve squash. Brush cut side with olive oil. Place oiled side down on a baking sheet. Cut tips off garlic and drizzle with olive oil. Wrap in foil and place on baking sheet. Cook squash and garlic 45 minutes to 1 hour, or until squash is tender. Remove and cool slightly. Squeeze garlic and scrape squash from skin. Cook bacon or chop almonds. Heat a soup pot. When it's hot, add butter. Cook over med heat until it's browned. Add squash, garlic, seasonings, balsamic vinegar, and vegetable stock. Bring to a boil. Turn off heat and blend with a hand blender (using the "S" blade) on 5th speed (high), or in batches in a regular blender (be sure to remove the middle plug in the lid and cover with a towel). Blend until smooth. Return to heat and simmer. Taste and adjust seasonings. If it's too thick, add more stock. 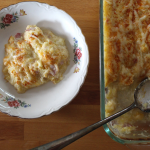 To serve, top with a drizzle of cream, some chopped almonds or bacon, and some GruyÃƒ¨re. **This soup is vegetarian unless you include the bacon. I made this today with a few slight variations…. SO GOOD!!! Making it even better was having fresh organic butternut squash. I topped mine with almonds, no bacon. I’m so glad you liked it, Heather! I’m with you on using what you have. I love gruyere, so we often have it on hand, but if not, I’d totally use something else. Same with the heavy cream. I love the coconut milk idea too. I made a similar soup yesterday but wanted to make it dairy-free so I used coconut milk. It was delicious!